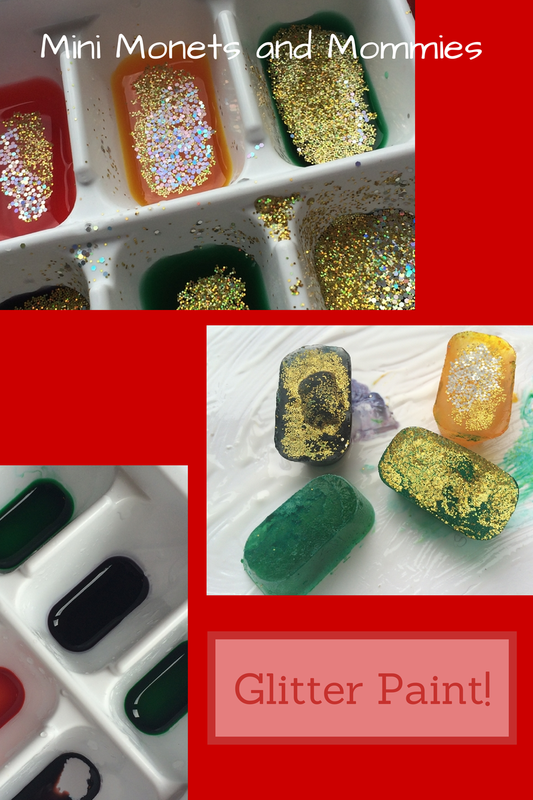 Mini Monets and Mommies: Kids' Glitter Paint Project: Freezing Art! Glitter art for kids? What kid doesn’t absolutely love sprinkling glitter on top of glue, paper, paint, her hair or anything else that’s not nailed down (and some things that are)? Even my 12-year-old tween son admits that when it comes to the sparkly stuff – he’s all in. That said, while the kiddos get a kick out of sprinkling sparkles everywhere, most moms don’t get the same rush out of cleaning the teeny tiny morsels out of every nook and crevice around the house. I’m always on the lookout for different ways to use glitter. Instead of just sprinkling the sparkly stuff all over a craft project, I tried freezing it! While simply stashing sparkles in the freezer won’t do, mixing them up into colorful ice cubes will. As a bonus, it adds in a science lesson on states of matter. If you really want to amp up the art and science connection, you can also throw in some color mixing. You can also keep a few left over cubes in the freezer and pull tthem out for a rainy day project. Before you begin, get scientific and hypothesize (yes, even a preschooler can learn that big old word and use it correctly in a sentence) what will happen when the colored water that you’re about to make freezes. If you’re adding in color mixing (i.e., you’re having the kids mix two different food colorings in each ice cube tray slot) start with that. Now you’re ready to start the melting ice cube glitter paint project! Caution- this is super-messy. I don’t mind the mess, but I would also throw down an open garbage bag or piece of cardboard on your workspace. 1. Squeeze a drop or two of food coloring into each compartment of the ice cube tray. You can have your mini Monet mix up her own hues by adding two drops- each one in a different color. For example, I added one red and blue drop to make purple. 2. Add water to the food coloring. 3. Sprinkle glitter into each liquidy colorful cube. 4. Put the cubes in the freezer until they – well, freeze. 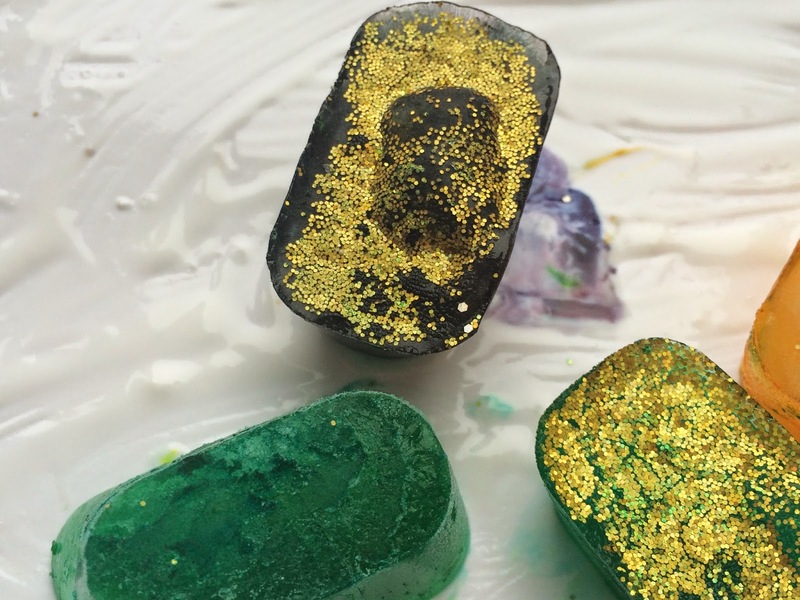 If you have an older child who 100 percent understands that these are not make-your-own popsicles (the glitter means you can’t eat them) go ahead and insert a craft stick into the center of each cube as they begin to freeze. Younger kids may confuse a popsicle stick with something that’s edible- if this is the case for your child, just use the regular cube. 5. Paint the paper with glue. Squeeze a golf ball sized pool of glue onto the center of the paper. Have your child spread it out with the paintbrush. 6. Pop out the sparkly cubes. 7. Have your child rub the cubes over the glue. As they melt the color and glitter will release into the glue. If she’s getting picky about her now colorful hands (the food coloring will temporarily stain her hands), she can push the cubes around with a plastic spoon or a popsicle stick. Don’t forget the science aspect. Ask your child why she thinks that this is happening? Are you looking for more glitter art activities? Check out and follow my Pinterest board for ideas! Pretty cool and my daughters second name is Glitter! She will love that! Thanks! My daughter will love this! I can definitely see how it can be messy...but what a fun idea! I think it is on our to-do list this summer! You could even try it outside. It will reduce some of the mess- but, not all. Wow! What a cool idea... I would have never thought to combine ice and glue. I could do this with my kids except I'm smart enough to "lose" glitter. =) But I can always buy more. What a star mother you are! Thanks! My house is still covered in the glitter from a few days ago. I love your ideas! Keep them coming! I love the end product! It looks like a beautiful sky scene! Thanks! The warmer it gets, the better this one is! What a great multi sensory activity. I never considered freezing glitter, but it would be a fun thing to pull out on a hot day. This would make a great summer project!